U.S. Kirkland's has a new coupon available now! U.S. Kirkland's coupon offer gives you a chance to save 15% on your entire purchase. 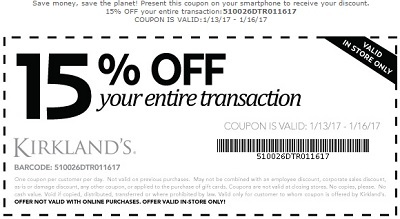 It is very easy to receive the offer, just print the coupon bring it to your nearest U.S. Kirkland's store location and enjoy the offer! Source of the information is Kirkland's. Offer is valid until January 16, 2017. For more information visit any U.S. Kirkland's store location or visit U.S. Kirkland's official website.